Washington, DC — The leaders of African American churches will, once again, convene in Washington, DC on Inauguration Weekend to commemorate one of the most extraordinary events in American history – the second term and inauguration of America’s first president of African descent. The gala celebration will mark this historic event and honor the Keepers of the Flame recipients, individuals whose lifetime achievements and contributions to society and culture have contributed to the realization of this moment in time. The African American Church Inaugural Ball will be held on Sunday, January 20, 2013, at 6 p.m. at the Grand Hyatt Washington. Like its premiere event in 2009, this year’s event will feature leaders and influencers from the religious, civic, business, arts, and entertainment communities. Attendees will gather to honor the 44th U.S. president, Barack Obama, and the great history and strength of the African American church, and its impact on the community. Themed, “Lift Every Voice and Sing,” the African American Church Inaugural Ball will honor extraordinary leaders with the “2013 Keepers of the Flame” Award. The recipients will be individuals who have an unshakable commitment to our future and an undeniable place in the African American book of history. Honorees include: Muhammad Ali; Bishop George E. Battle, Jr.; Bishop Philip R. Cousin, Sr.; Andraé Crouch; Ed Dwight; Joycelyn Elders, MD; Bishop William H. Graves, Sr.; Rev. Dr. Cynthia Hale; Elaine R. Jones, Esq. ; Dr. Vernon E. Jordan, Sr., Esq. ; Hugh Masekela; Rev. Dr. Otis Moss, Jr.; Jessye Norman; Beny Primm, MD, Ruby Dee and Cicely Tyson. Roland Martin, journalist, author and CNN contributor, will serve as the master of ceremonies. Special musical performances will include a tribute to South African President Nelson Mandela by African jazz legend Hugh Masekela; a special tribute to Rosa Parks by jazz saxophonist Ski Johnson and musical presentations by gospel artists Byron Cage, Pastor Charles Jenkins and actress/singer Simone Joy Jones. In 2009, distinguished honorees included: Dr. Maya Angelou, Donna Brazile, Dr. Johnnetta B. Cole, Dr. Marian Wright Edelman, Dr. John Hope Franklin, Earl Graves, Sr., Rev. Dr. William H. Gray, III, Bishop Barbara Harris, Dr. Dorothy I. Height, The Honorable Alexis Herman, Rev. Dr. Benjamin Hooks, Congressman John Lewis, Rev. Joseph Lowery, Marc Morial, Rev. Al Sharpton, Rev. Gardner Taylor, Archbishop Desmond Tutu, and Rev. Wyatt Tee Walker, Sr. The Executive Producer is Pernessa Seele, who is the Founder/CEO of The Balm In Gilead, Inc., the gala’s fundraising beneficiary. The Balm In Gilead, a nonprofit, international organization, is committed to a dynamic, community-driven approach, contributing a lasting response to health disparities and ensuring that African Americans will become fully knowledgeable about the Affordable Care Act. Seele, whose voice spans continents, was included in Time Magazine’s 100 Most Influential Persons in the World and Essence Magazine’s 50 Most Powerful Women Shaping Our World, along with Oprah Winfrey. 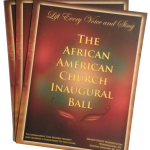 For more information on the African American Church Inaugural Ball, visit www.AACIB.com. For more information on Pernessa Seele and The Balm In Gilead, visit www.balmingilead.org. The Media should contact UniWorld Group, Inc. – Teresa Lyles Holmes, (212) 219-7239, teresa.holmes@uwgny.com; or Camille Gray, (212) 219-7121, Camille.Gray@uwgny.com.